So, does anyone feel inspired by their work attire? Do you bounce out of bed in the morning excited by the challenge of clothing your body in something that is professional, stylish, attractive, represents your personal style, but is also able to convey competence and confidence? I, for one, have never really consistently rocked the work attire game. From a fashion perspective. I am never sure what really counts as “work appropriate” and what is a little too wild, too casual, or too fancy. My very lady-like pal Lisa is always telling me things like “JEN, you can’t wear jeggings to work!” I have seen her stricken looks when she has seen some of the things that I have went to work in. I really do want to look polished, but I feel like I fail SO hard sometimes. So, when this article about Matilda Kahl’s work outfit, Why I Wear the Exact Same Thing To Work Every Day, I was inspired. Kahl, who works in the creative industry, reflects on how much pressure women face to maintain a flawless and fashionable appearance, commenting that the “work outfit” takes back those HOURS of stressing about achieving this impossible standard. Taking a page from Kahl [and other successful people who have done the same – Obama, Einstein, Jobs, Zuckerberg, for example], I have decided to implement a uniform system. By routinizing this aspect of my life, I won’t have to make decisions about what to wear every morning, so I can concentrate my energy on other decisions. 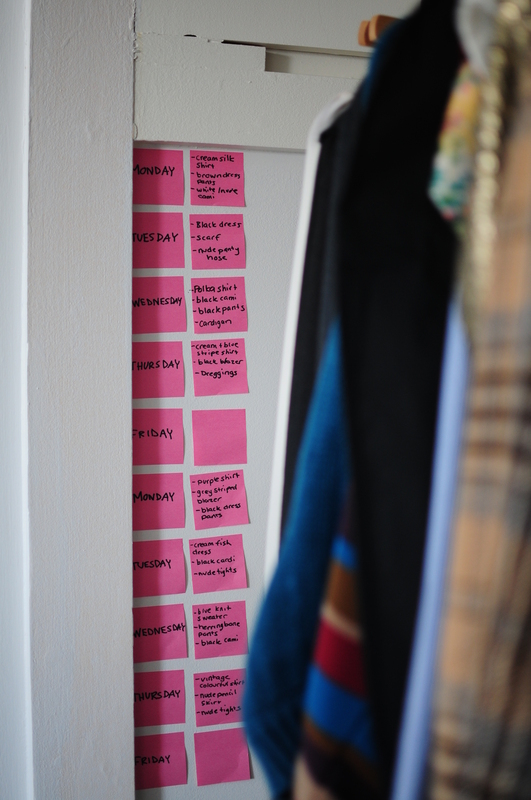 But since I have a closet full acceptable pieces, and I don’t have the budget to buy 15 copies of an ideal outfit, I have decided to create a “days of the week” system for outfits with a two week rotation. That was the great thing of serving in the army when I was young. Never had to worry about what to wear. Always the same green cargo pants and green sweater, green socks and brown boots. Exactly! Makes the morning routine so much simpler! I don’t have to worry about what I wear to work, as there is a strict dress code. Most days I appreciate that I don’t have to put any thought into what I am going to wear. But, I miss the days I could choose what colour shirt to wear, or a different type of shoe, or even a dress. So I can see the value in not spending a lot of thought on outfits, but I also see value in deciding spur of the moment to wear that pink dress or striped top. I guess the grass is always greener on the other side. Haha. I note the presence of “dreggings” on your list – what the heck are they? Also, do you think anyone at your workplace will notice your rotation? I don’t fault you for not being aware of the ultra-trendy “dregging” trend (dress-pants leggings), as it is probable that I am the only person to refer to them as such. I actually don’t think people will notice – I think it would be more obvious if I did the strict uniform approach with the same outfit every day, but two weeks is a long time for anyone to remember outfits. Unless I have a workplace stalker who takes a creepy level of interest in my attire. I am finishing off my first two week rotation right now, and will start the cycle again on Monday.